Photo courtesy of Kimi Farley. That chicken’s got quite a personality lol. Try being nice and polite while being cooked in a hot pot…. 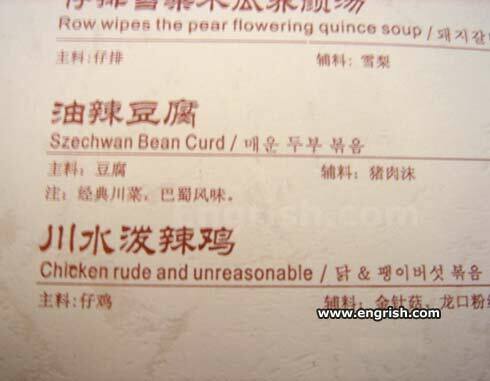 nasty mean chicken was rude and unreasonable…. so we fried it alive and gave it to you to eat happily and proud! agh! next time, that thing better learn to use a toilet and not someone`s head or im gonna bring my dog to eat it SLOWLY before it could ever die an unpainful death. its gonna die a bad death and my dog will slowly, joyously tear its skin and stomp out its blood. i never WANTED to eat that discusting thing myself anyway. Fight for your meal ! ! ! ! ! It just kept going on and on about that crazy “sky is falling” conspiracy theory. We couldn’t get a word in edgewise. The chicken disagrees with me. My guess is that it was originally called “Saucy chicken,” and the owners wanted to use a synonym for “saucy” instead. “Saucy” is sometimes used to describe rude, disrespectful, and/or impertinent people. That chicken needs to learn some clucking manners.